Even if you don't give your child toy guns, there's a good chance he'll find weapons -- and often right in the kitchen. 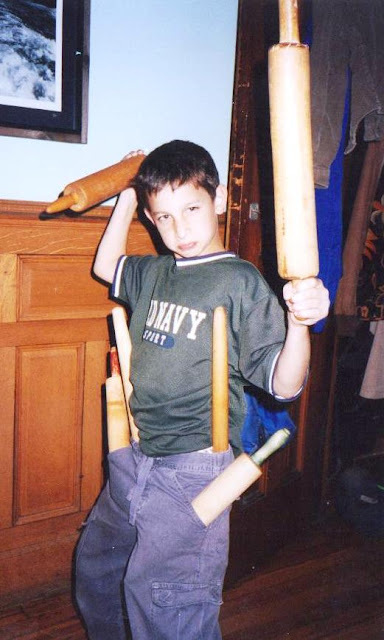 I doubt my son Peter (pictured above at 10, but who is now nearly 21) was channeling his inner baker when he gathered several of my rolling pins, struck an offensive pose and declared himself "Rolling Pin Man." Unfortunately, his early exposure to rolling pins, and all manner of things cooking and baking at home, did little to further his own culinary skills. These days, he favors takeout pizza and all-you-can-eat sushi!! I did do one thing right. Took him to the legendary Difara's Pizza in Brooklyn, and he often makes a pilgrimage there when he's home from college. Up next in the kitchen adventure lineup: Either Magic Cream Pie, Moonlight Cake or Chocolate Pudding -- all from a housewife's recipe collection I bought last year at an estate sale. Hope you'll stay tuned! it's hard to look tough brandishing a rolling pin :) I vote for pudding!